Neanderthals existed for hundreds of thousands of years in Eurasia. But their range was limited compared to modern humans. In less than 50,000 years humans have explored and spread out to all the continents. Exploration had its most dramatic rise during the Age of Discovery. This is when European explorers sailed and charted much of the rest of the world. Humans have explored geographically even into outer space. They explore ideas, art, even the very nature of life. The Phoenicians were a culture that existed in the coastal region of the Levant as early as the 3rd millennium BC. They were not a significant culture until about 1100 bc. By the 9th century BC the Phoenicians had became the dominant culture in the Mediterranean Sea. They grew wealthy through trade. Instead of war they used trade agreements and alliances to expand their colonies. The Phoenicians developed advanced navigational skills and had the best ships in the Mediterranean. They explored over land routes and developed caravan routes to trade with distant places. Carthage got its start as a Phoenician colony on the north coast of Africa. It grew to be their largest and most successful colony. Gradually the western Mediterranean Phoenician colonies all came under the control of Carthage. The Carthaginians were explorers too. Two major explorations are are mentioned by early writers. Both took place around 500 BC. Pliny the Elder wrote that Carthage sent an explorer named Himilco to explore the remote parts of Europe. The report, or periplus (sailing record), has not survived but other early writers have seen it. He had as many as 60 ships in his fleet. He would have traveled along the Iberian Peninsula up the coast of Gaul. Avienus, a Roman writer of the 4th century AD, wrote about the expedition. Himilco moved north from Brittany to the British Isles. 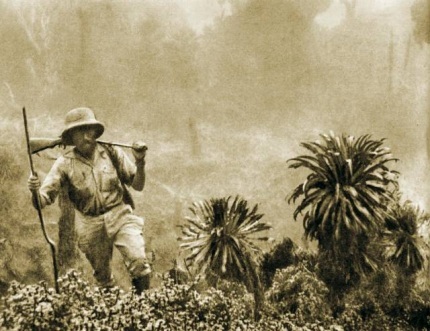 It is likely he was looking for tin, a rare metal at the time. He reached a land called Latin: insula sacra, “The Holy Island”, generally believed to be Ireland. About the same time, Hanno the Navigator was sent to explore the western coast of Africa. His periplus has survived and is one of the earliest surviving manuscripts. The periplus records landmarks, ports and sailing distance between them. It is a guide for other ship captains to follow. Hanno's 60 ships moved south along the African coast. He may have reached as far as as an island off the coast of Sierra Leone. There is no record of any other explorations of the west Africa coast until the time of Henry the Navigator, the Portuguese explorer. One of the first scientific explorers was Pytheas of Massalia. He was an ancient Greek from the then Greek colony of Massalia (now Marseille). He made a voyage to northwestern Europe in about 325 BC. He circumnavigated Great Britain. Pytheas was the first person on record to describe the Midnight Sun. 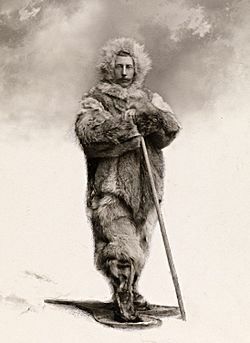 He is the first known scientific visitor and reporter of the Arctic polar ice. His account of the tides is the earliest known to suggest the moon as their cause. During the 2nd century BC, the Han dynasty explored much of the eastern part of the Northern Hemisphere. In 139 BC, the Han diplomat Zhang Qian traveled west in an unsuccessful attempt to secure an alliance with the Da Yuezhi. He discovered countries the Chinese did not even know existed. He had traveled as far as the Indus River in northwestern India. During the Viking Age Three different groups of Vikings can be identified from different parts of Scandinavia. The Danes, Swedes (also called the "Rus") and Norwegian vikings. The 'Rus', founded the settlement of Kiev. Named for themselves they called it Russland (later known as Russia). Swedish Viking explorer Garðar Svavarsson was the first to circumnavigate Iceland in 870 and establish that it was an island. About 890 CE Vikings, led by Ohthere of Norway, traveled north above the Arctic Circle to the White Sea. About 982, the Norwegian Erik the Red explored Greenland. In 986 he returned to Iceland, from where he sailed. He convinced others to follow him and founded the first settlement there. By the year 1000 there were a thousand settlers living there. Erik's second of three sons, Leif Erikson was probably the first European to set foot on North America. He landed at a place he called "Vinland". Marco Polo (1254-1324) was a Venetian merchant and explorer. He traveled across Asia during the height of the Mongol Empire. He was one of the first Europeans to explore Eastern Asia. He left Venice at age 17 with his father and uncle. They traveled what later became the Silk Road. They reached Cathay (China) where Marco Polo entered the court of Kublai Khan. He traveled and explored China for 24 years. He brought back ivory, jade, jewels, porcelain and silk. He brought back many other things including noodles from China which the Italians called pasta. 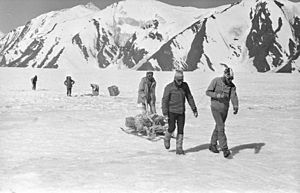 The 1982 expedition in the Pamir Mountains to Tartu Ülikool 350 and Mt. J. F. Parrot. Christopher Columbus was a Genoese navigator and explorer in the employ of Isabella of Castile. Under the Portuguese flag in 1492 he sailed three ships to discover a trade route to asia. Instead he discovered the Americas. It was thought he was the first European to discover America, but Norse explorers had discovered the continent centuries earlier. His discovery triggered a series of explorations by other Europeans. He made a total of four voyages. The cost was high among the native populations, many of which were wiped out completely. They had no immunities to common diseases of Europe. As many as five million native Americans died due to disease, starvation and war with Europeans. Vasco da Gama was a Portuguese mariner. He was the first European to sail to India via the Cape of Good Hope at the southern tip of Africa. 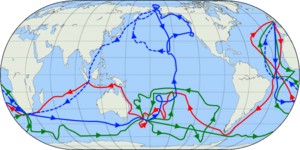 He made three voyages to India via this new trade route. In 1497 he left Lisbon with four ships plus a storage ship of unknown name. No European explorer before him had sailed further than the place that is now called South Africa. Vasco da Gama sailed around the bottom of the African continent. His voyages put Portugal in a very powerful position to trade with India. The Portuguese set up outposts along the African coast. Ferdinand Magellan was a Portuguese explorer. Flying the flag of Spain he discovered the Strait of Magellan (named for him) connecting the Atlantic ocean with the Pacific. He was the first European to sail the Pacific Ocean. He was killed in the Philippines in 1521. But his ships, under command of the Basque navigator Juan Sebastián Elcano sailed west to Spain completing a circumnavigation of the globe. This proved the earth was round. Giovanni da Verrazzano was a Florentine explorer of North America who sailed under the French flag. He is known for being the first European (since the Norse) to explore the East Coast of the United States. In 1524 the King of France sent Verrazzano search for a “Northwest Passage” to Asia through North America. He explored the coast between Cape Fear in North Carolina and Newfoundland. He explored what is now New York Harbor and Narragansett Bay. He wrote accounts of lands and inhabitants he found. Some were accurate, but some were not. His return the same year gave France claim to all of North America. He sailed two more times to the Americas. On his last trip he was captured and killed. This is believed to be on Guadeloupe in the Caribbean Sea. Samuel de Champlain was a French navigator, cartographer and explorer. In 1608 he founded Quebec City. He discovered lake Champlain (named for him). He is recognized as the father of New France. Champlain explored much of western New York and the eastern Great Lakes. James Cook was an English explorer, navigator and cartographer. Captain Cook made three voyages to the Pacific Ocean. He mapped many areas and recording several islands and coastlines on European maps for the first time. He explored the east coast of Australia. He discovered the Hawaiian Islands. He was also the first to map parts of Newfoundland and New Zealand. In 1769 he received a gift from a Polynesian priest named Tupaia. It was a map of all the major islands of the South Pacific—the first any European had ever seen. It matched what Cook had already explored and included other parts of the Pacific he had not seen. It allowed him to bring back an accurate map of the Pacific. There are many reasons humans explore outer space. It was first explored with human eyes. Ancient men mapped the universe they could see. Then came the invention of telescopes. In the mid-twentieth century man actually began exploring space with rockets and Spacecraft. The most important reasons are scientific research and the interest of humans to learn more about the universe. Space exploration has developed new technologies. It has created new products and new industries. In scientific research, exploration is one of three purposes of empirical research. The other two are description and explanation. The term is commonly used metaphorically. For example, a person may speak of exploring the Internet, exploring sexuality, or concepts one cannot physically explore. Exploration Facts for Kids. Kiddle Encyclopedia.